Offered in 384-well plate format. A unique collection of 760 kinase inhibitors for high throughput screening (HTS) and high content screening (HCS). Identification of bioactive HDAC inhibitors in bovine cardiac tissue. Bovine cardiac tissue was treated with increasing concentrations of indicated nonflavonoids (A and B) and flavonoids (C and D) for 2 h. Bovine cardiac tissue was subsequently incubated with fluorogenic HDAC substrates for 2 h prior to addition of stop solution for 20 min. Fluorescence was assessed via BioTek Synergy plate reader and demonstrated pan-HDAC inhibition of all compounds. Scatter plot from phenotypic kinase inhibitor screen T. brucei 221 strain showing duplicate screens for the 274 compounds used in the phenotypic screened at 1 μM. Black dots represent results from first independent screen (221A) and grey dots represent results from second screen (221B). Dotted line represent cut-off point for 3 standard deviation below the mean (solid black line). Epigenetic chemical compound library screen for the effect of 24 compounds on adipocytic differentiation of human skeletal (mesenchymal) stem cells (hMSCs). Representative Oil Red O staining of lipid-filled mature adipocytes on day 7 after treatment with the indicated compounds (500 nM). Images were taken at 320 magnification using a Zeiss inverted microscope. Abbreviation: DMSO, dimethyl sulfoxide. (c) Dot plot summarizes the results of Phase I EpI screen. y-Axis indicates cell viability and x-axis represents induction of Ecad promoter activity. Five drugs, Vorinostat, Bortezomib, Etravirine, Niclosamide and Crystal violet, were identified with more than twofold Ecad promoter activity. (d) Dot plot summarizes the results of Phase 2 screen on HDAC inhibitors. Summary of the CCN1-GFs screening, calculated as the relationship between GFP fluorescence intensity using a fluorescence meter. Hit compounds display varying effects on p‐EGFR and EGFR levels. Of 21 EGFR/ERBB hit compounds that selectively targeted chordoma cells, the impact of 13, comprising a selection of hit compounds across the libraries and chemical structures tested, was studied by western blot on three chordoma cell lines (U-CH1, U-CH2, MUG-Chor1). Cells were serum‐starved overnight before being treated with EGFR inhibitors (250 nm) for 4 h and then being exposed to EGF (50 ng/ml) for 15 min. Results of clinical collection compound primary screen. Panel A. Scatterplot representing the results for the screen at 5 μM. Green circles represent the hits, blue circles are all the other compounds. Panel B. Scatterplot representing the results for the screen at 15 μM. Green circles represent the hits from the 5 μM screen, blue circles are all the other compounds. Panel C. Scatterplot comparing T. cruzi percent inhibition between 5 μM and 15 μM screens. Panel D. Replicates plot for a subset of compounds screened twice at 5 μM (n = 579, R2 = 0.86). Graphical representation of hit compounds that block cardiomyocyte hypertrophy. (A) Compounds from the Spectrum Library are depicted based on percent inhibition of ANF expression (X-axis) and cell area (Y-axis) relative to the positive control HDAC inhibitor, TSA; % inhibition by TSA was set to 100% for each plate. Reduction in the number of identified cells (nuclei) compared to the positive control TSA was used as an indicator of toxicity. Toxic compounds are indicated in red, and were removed from subsequent analysis. (B) Class I hits are those compounds that significantly reduce cell area and ANF expression. Class II hits are compounds that significantly reduce cell area, but increase ANF expression. Screening small molecule library in 384-well plates. (A): Schematic diagram of HTS screening of small molecule library. (B): Screening results of an epigenetics library. Each heat map represents one 384-well plate treated with the epigenetics library in duplicate wells at specified concentration(0.1, 1 and 10 μM). Wells G11 and K11 were duplicate wells of 5-aza-C. Wells K7 and L7 were duplicate wells of 5-aza-dC. (c) Percentage of H3.3S31ph positive cells after treatment with candidate compound hits identified from the inhibitor library screen. The targets of inhibitors are the following: WZ3146: EGFR; Sorafenib Tosylate: VEGFR, PDGFR, and RAF/MEK/ERK; AT7519: CDK1, 2, 4, 5, 6, and 9; Hesperadin, AZD1152-HQPA, and ZM447439: AURKB; AZD8055 and KU-0063794: mTOR; MK-2206: Akt1, 2, and 3; GSK2126458: PI3K and mTOR. Plots of locomotor seizure behaviour for 5 dpf scn1Lab mutants screened against (A) 52 ion channel ligands. Threshold for inhibition of seizure activity (positive hits) was determined as a reduction in mean swim velocity of 540% (red line). Blue data points represent compounds that were classified as toxic as treated larvae have no visible heartbeat or movement in response to touch after 90-min exposure. Plots of locomotor seizure behaviour for 5 dpf scn1Lab mutants screened against (B) 254 compound GPCR ligands. Threshold for inhibition of seizure activity (positive hits) was determined as a reduction in mean swim velocity of 540% (red line). Blue data points represent compounds that were classified as toxic as treated larvae have no visible heartbeat or movement in response to touch after 90-min exposure. The screening of Aβ40 inhibitors using AD models. (a) Scheme showing the cell culture procedure of chemical screening. (b) The result of first screening of Aβ40 inhibitors. The red line shows the value of the average ratio minus double the standard deviation (Ave - 2SD = 0.33). The compounds that reduced the Aβ40 ratio below Ave - 2SD value (0.33) passed the first screening. The Aβ40 level of DMSO treatment was considered to be 1.0. (c) The result of second screening in Aβ40 inhibitors. The red line indicates the criterion of hit compounds in the second screening (=0.5). (d,e) The effects of Aβ inhibition (d) and cell survival (e) in dose-response experiments using K1-derived neurons. These results show that PS1-overexpression did not influence the screening of Aβ inhibitors. The numerical data is shown in Supplementary Table S2. The amount of Aβ40 and cell viability in DMSO-treated PS1-G378E or K1 neurons was defined as 1.0. *P < 0.05, as determined by Steel’s test. Three independent experiments, each time in triplicates were performed (n = 3). Values are Mean ± SD. AraC, cytosine arabinoside; G378E, PS1-G378E neurons; K1, KhES-1-derived neurons; Nilo, Nilotinib; Pime, Pimecrolimus; Rosu, Rosuvastatin Calcium; Sulc, Sulconazole Nitrate salt; Tore, Toremifene Base. (A)Schematic view of virtual screening workflow on human ABCB1 and human ABCG2. (B) The sensitization effects of virtual screened compounds on SW620/Ad300 towards doxorubicin. (C) The sensitization effects of virtual screened compounds on NCI-H460/MX20 cells towards mitoxantrone. (D) Chemical structure of bafetinib. The results of the high-throughput screening (HTS) of 1017 FDA-approved drugs in the DSP assay for MERS-S. Screening results of 1017 drugs using the HTS DSP assay. (A) The vertical axis shows the reading of the DSP activity (RL activity) for the tested drugs (1 μM). The RL values were normalized to the control, which contained DMSO only. The horizontal axis represents the identification number arbitrarily assigned to each drug. Each dot represents an individual drug. The dotted line indicates 20% of the control. The value of the most active drug, nafamostat, is indicated (1.66% of the control). Relative wound density and cell viability z-score data of the shortlisted candidates from the primary screening assay. Based on their effect on migration and cell viability, the drugs were binned into high confidence and medium confidence migration and cytotoxic classes. a The migration z-score of the candidates are shown, drugs with a z-score between the dotted line (-1.6) and the straight line (–2) were binned into medium confidence migration class and the drugs with z-scores beyond the straight line (<-2) were binned as. Screen of library of FDA-approved library validates the adenylate kinase assay and indicates it is more sensitive than growth-based assays. A. Scatter plot of raw data from primary screen of the Selleck FDA-approved drug library. The cut-off for hit identification (2-fold increase in AK activity) is indicated by the solid line. 355 compounds from the Selleck library were docked into the six generated PRK1 homology models, the obtained docking poses were minimized using an implicit solvent model, and BFE calculation was subsequently performed. The predicted pIC50 was calculated using the developed QSAR model. Chemical screen targeting erythroid enucleation. (B) For the compound screen orthochromatic erythroblasts were isolated by FACS and subsequently incubated in 96-well plates in the presence of the compounds for 5h. The extent of enucleation was assessed by FACS LSR II. Graphs showing that the raw data between the duplicate assay plates are reproducible. (C) Graph showing compounds confirmed to significantly (paired student's t-test) inhibit enucleation compared to the vehicle control (DMSO). Data are means (+/− SD) of 4 independent experiments. *P< 0.05, **P< 0.01, ***P< 0.001, ****P< 0.0001 (paired student's t-test). Discovery of small-molecule inhibitors of MST3 using DSF. a) Distribution of compounds as a function of △Tm values. Of the 277 compounds screened, 23 compounds interfered with the assay due to intrinsic fluorescence or precipitation and were discarded from further evaluation; 109 compounds showed negative temperature shifts (-2.8 to -0.01℃) and were denoted as zero. Each bar represents compounds with △Tm ≤x-axis value, that is, 0: △Tm≤0; 1: △Tm≤1, etc. b) Identifiers and associated IC50 and △Tm values of compounds confirmed as MST3 binders by X-ray crystallography. c) Logarithmic proportionality between DTm and IC50 values; data were fit to Equation (1), yielding y0=4.08±0.3 and a=-0.93±0.09. Hits of high throughput in vitro drug screen of three MLS cell lines. List of 27 drugs with a reduction in cell viability of >50% in two or all three cell lines at a drug concentration of 100 nM. Strong inhibitory effect of the survivin inhibitor YM155 is observed in two out of three MLS cell lines. Also, a good response is observed to several conventional chemotherapeutics, like doxorubicin, gemcitabine, and paclitaxel. Per drug, four concentrations (1, 10, 100, and 1000 nM) are tested; green boxes correspond to a high cell viability (~100%) and red boxes to a loss of cell viability (~0%). For comparison, at the bottom, five compounds are randomly shown that did not meet the criteria. CCRF-CEM and Jurkat cells display a differential response to kinase inhibitors: Cells were treated with 100 nM (A) and 1000 nM (B) concentration of a panel of kinase inhibitors (378 inhibitors) for two days. Cell viability was measured using PrestoBlue cell viability assay. Selective inhibitors from “A” and “B” were used in figure "C" and "D". The impact of FDA-approved drugs on ERa levels in MCF-7 cells. (A) Pie diagrams depicting the pharmaceutical categories in the library. (B) Synthetic protocol used for drug administration to MCF-7 cells. (C) Assay data depicting the quantitation of ERa levels in each one of the 162 performed Western blots. Z0 is the Z factor for negative (DMSO) and positive (E2) controls in each Western blot analysis. Robust Z scores (Z*) graphs for drug-treated samples alone (D), in combination with E2 (E) or for the effect of E2 within each drug-treated sample (i.e., E2þdrug/drug alone) (F); red arrows indicate the Z* for drugs considered as positive hits. Red lines indicate the threshold used for analysis. Western blot analyses of ERa and cathepsin D (Cat D) expression levels in MCF-7 cells treated for 24 h with E2 (1 nM) both in the presence or in the absence of 100 nM estriol (ESTR) (G), coumarin (COUM) (G0), basedoxifene (BASE) (H), vinblastine (VINB) (H0) and carfilzomib (CARF) (I) or vehicle (DMSO-CTR). The loading control was done by evaluating vinculin expression in the same filter. High-throughput luciferase screening to identify parkin inducing compounds. (A) Schematic illustration of the high-throughput screening method. HEK-293T parkin reporter cell line (parkin-LucHEK-293T) was selected by stable transfection of the luciferase construct containing three repeats of parkin promoter’s CREB/ATF4 binding motifs. In a 96-well plate, 1172 FDA-approved drugs were used to treat parkinLuc-HEK-293T cells. Parkin promoter activity was measured by luciferase assay. DMSO was used as a negative control. CCCP treatment was used as a positive control. (B) Parkin promoter activities in parkin-Luc-HEK-293T cell line treated with DMSO or 10uM CCCP as positive control (n=4) were measured by luciferase assay. (C) Scatter plot showing relative increase of parkin promoter activity in parkin-Luc-HEK-293T cell line treated with each compound compared to DMSO negative control based on luciferase assay. Top 20 compounds were highlighted in red color. (D) Relative increase of parkin promoter activity induced by the top 20 compounds based on the initial HTS screening determined by luciferase assay (n=9, see also Table 1). Quantified data are expressed as mean±s.e.m. *P<0.05, **P<0.01, and ***P<0.001, nonparametric Kruskal-Wallis ANOVA test (B) and ANOVA test followed by Tukey post hoc analysis (D). (c) Results of the second-round test on Aurora kinases inhibitors. Samples are under corresponding treatment for 3 weeks and measured by bioluminescence. CTRL, control. P value is determined by two-tailed unpaired Mann-Whitney U-test with multiple-test correction. N=6 bone fragments in each group. Representative bioluminescence images are shown at the bottom of the panel. (d) Results of the second-round test on HMT inhibitors. Samples are under corresponding treatment for 3 weeks and measured by bioluminescence. P value is determined by two-tailed unpaired Mann–Whitney U-test with multiple-test correction. N=6 bone fragments in each group. Representative bioluminescence images are shown at the bottom of the panel. 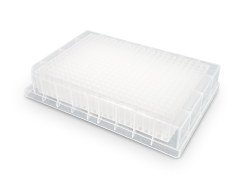 Screening small molecule library in 384-well plates. (A) Schematic diagram of HTS screening of small molecule library. (B) Screening results of an epigenetics library (128 compounds; see Table S1 for a description of compounds in each well). Each heat map represents one 384-well plate treated with the epigenetics library in duplicate wells at specified concentration (0.1, 1 and 10 μM). Wells G11 and K11 were duplicate wells of 5-aza-C. Wells K7 and L7 were duplicate wells of 5-aza-dC. Emodin was found to inhibit DPP4 activity after screening a natural compound library. c Heat map of selected anti-cancer compounds exhibiting strong inhibition in at least one of the PDC lines. The scale represents percentage inhibition of the compounds, with inhibition score <50% shown in grey. d Selected molecular signatures (P < 0.05) of genes that show elevated expressions across the five Met cell lines, some of which appear to be associated with the selective responses of PDC lines to compounds of same target classes. Example of screen results for a pair of single 384-well plates treated with drug library only (top) and drug library plus 400 nM MK1775 (bottom). The histograms show counts versus γH2AX median values in S-phase. Repurposing Library contents. (a) Highest clinical phase achieved by each compound. 3,422 drugs in the library have reached clinical use as of November 2016. (b) Number of compounds per target category. Compounds with multiple targets might be indicated in more than one category. (c) Number of approved drugs for indications within each listed disease area. (d) Classification of proteins targeted by library drugs. Protein function hierarchy is shown with increasing specificity of function corresponding to distance from the figure center. The relative area of each segment is proportional to the fraction of the Repurposing Library targeting each protein class. As expected, the library is enriched in drugs targeting kinases, GPCRs, and ion channels. scatter plot representing percent growth inhibition of WT L. monocytogenes in the presence of a combination of a sublethal dose (1 μg/ml) of the β-lactam ceftriaxone and each compound in the screen. The solid black line represents the library mean (μ), and the dashed black line and gray line represent two (2σ) and three (3σ) S.D. above the library mean, respectively. The cyan, green, and red data points represent staurosporine, GSK690693, and other compounds from the IPA family, respectively. (A) HTS assay timeline. Vero cells were seeded at a density of 1 × 104 cells per well in 96-well plates. After overnight incubation, cells were treated in duplicate with 10 μM compounds. One hour later, 20 μl RVPs was added. The supernatant was removed 1 h later and the compounds were readded to the cells for an additional 23 h. (B) (Left) HTS assay flowchart. The criterion required for the compounds to pass the primary screen was inhibition of >90%, and 28 primary candidates were selected. In the reconfirmation screen, 9 compounds with dose-dependent inhibition and cell viability of >80% were selected. (Middle) HTS of a library of 1,018 FDA-approved drugs for primary candidates inhibiting JEV infection. Each dot represents the percent inhibition achieved with each compound at a concentration of 10 μM. The dots located in the blue box represent inhibition of >90%. (Right) IC50s, CC50s, and SIs of nine compounds selected from the reconfirmation screen. The top five compounds depicted in the blue box showed SIs of greater than 10 and were designated hit drugs. Normalized effect of inhibitors grouped according to their primary targets on SmoIP fluorescence. Effect of Hh stimulation on untreated cells set as 100% (dashed line). Diameter of circle reflects number of components per cluster, cutoff N ≥ 3, clusters sorted along X axis accordingly. Inhibitors used at 15 μM. 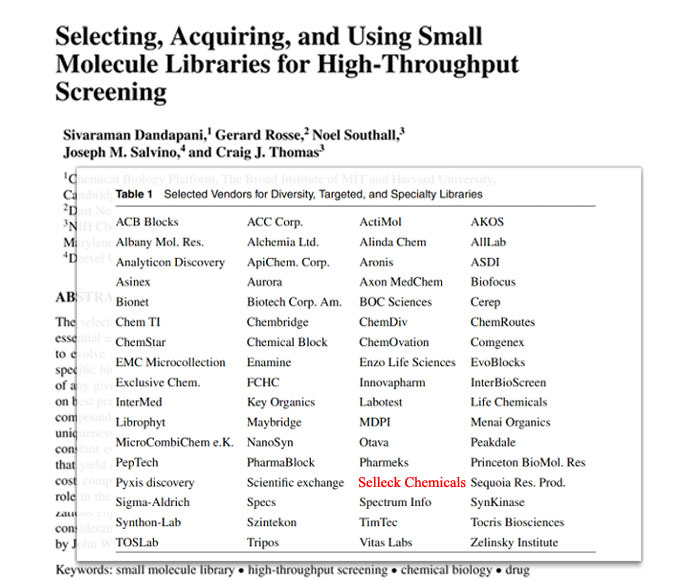 Select statin class drugs lysed S. mutans in an AK assay screen of the Selleck library. Statins were identified in the screening of the Selleck library against planktonic cultures of S. mutans UA159. The data are representative of 2 independent screens. Effects of compound 18n (A,B) and compound 20b (C,D) on the ROS of of HepG2 cells. The level of intracellular reactive oxygen species (ROS) in HepG2 cells was measured by flow cytometry/ Data were shown as mean ± SEM (n = 3). High-content drug screening. A, Schematic of the screening process and hit selection. Phases of 3D screening and follow-up drugs testing are listed on the left. Numbers represent the considered candidate compounds after each phase. B, Examples of brightfield and fluorescent images of DMSO-treated MCS obtained from three NB cell lines. C, Illustration of image analysis with an in-house–developed algorithm evaluating spheroids viability. Values in black correspond to the spheroid area as compared with vehicle-treated controls, whereas the ratio of calcein fluorescence in the rim and center of each spheroid is in red. Zero multiplier (light green) is introduced when calcein staining of a spheroid is comparable with the background. D, Scatter plot demonstrating the results of the primary screening in CHP-134. Each dot represents one compound, and the white color indicates primary hits. E, Venn diagram showing the number of primary hits (n ¼ 193), among which 60 are FDA-approved, emerged as potentially effective in at least two NB cell lines. High-throughput luciferase screening to identify parkin inducing compounds. (A) Schematic illustration of the high-throughput screening method. HEK-293T parkin reporter cell line (parkin-Luc-HEK-293T) was selected by stable transfection of the luciferase construct containing three repeats of parkin promoter's CREB/ATF4 binding motifs. In a 96-well plate, 1172 FDA-approved drugs were used to treat parkin Luc-HEK-293T cells. Parkin promoter activity was measured by luciferase assay. DMSO was used as a negative control. CCCP treatment was used as a positive control. (B) Parkin promoter activities in parkin-Luc-HEK-293T cell line treated with DMSO or 10uM CCCP as positive control (n=4) were measured by luciferase assay. (C) Scatter plot showing relative increase of parkin promoter activity in parkin-Luc-HEK-293T cell line treated with each compound compared to DMSO negative control based on luciferase assay. Top 20 compounds were highlighted in red color. (D) Relative increase of parkin promoter activity induced by the top 20 compounds based on the initial HTS screening determined by luciferase assay (n=9, see also Table 1). Quantified data are expressed as mean±s.e.m. *P<0.05, **P<0.01, and ***P<0.001, nonparametric Kruskal-Wallis ANOVA test (B) and ANOVA test followed by Tukey post hoc analysis (D). Compound 1773 inhibition of the enzymatic activity of recombinant Legumain. (A) 10 μM of compound 1773 was incubated with recombinant Legumain and the fluorogenic substrate. (B) Specificity testing of compound 1773. 1 or 10 μM of compound 1773 was incubated with different concentrations of AMC (0–64 μM) alone and fluorescence measured every 2 min for 20 cycles. Compound 1773 was screened out from 500 compounds library (FDA-Approved-Drug-Library, Selleck, USA). Phosphorylation of CREB affected by different concentrations of TG100-115 determined by using immunoblotting. TG100-115 was screened out from a kinase inhibitors library for highly potent inhibiting TRPM7 kinase. LeX-specific antibody SSEA-1 was preincubated with different concentrations (1–80 μM) of gossypol (red), folic acid (blue), orlistat (orange), tosufloxacin tosylate (purple), ursolic acid (green), or the control compound idarubicin (black) and added to wells coated with the LeX glycomimetic peptide. The signal of LeX-specific SSEA-1 antibody alone without any competing chemical compound was set on 100%. 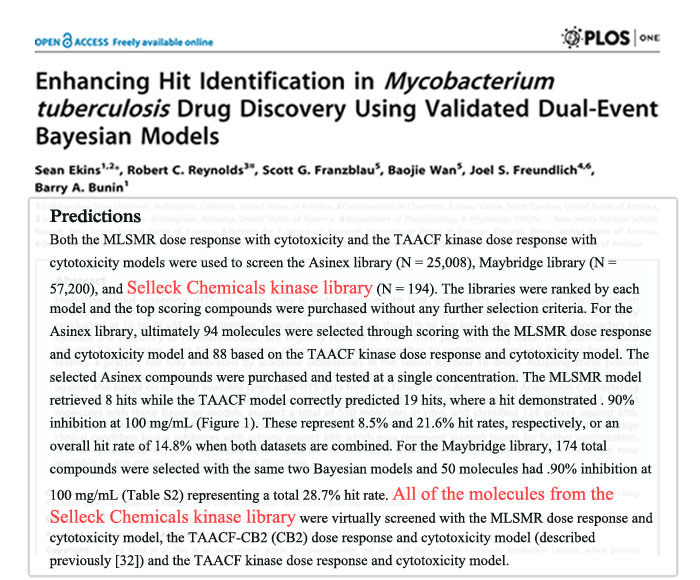 Asterisks signify differences in competition between all LeX mimetic compounds and the negative control compound idarubicin as calculated by one-way analysis of variance (ANOVA) followed by Fisher’s PLSD test (F = 9.468, p = 0.0001; PLSD *p < 0.05). Gossypol and ursolic acid were from the Natural Product Library. PC9GR, H1650, and H1975 cells were treated with 124 compounds in a natural product library. These compounds showed as more than 50% cytotoxicity of these three cell types. In vitro anti-fibrotic drug screening for the FDA-approved drugs 1-75 (a) and FDA-approved drugs 76-150 (b). HEK293T cells were transfected with luciferase reporter driven by NF-jB response elements for 24 h, and treated with 104 drugs or DMSO for 12 h. Luciferase activity was determined using the Dual-Luciferase Reporter Assay System. 1,649 compounds were screened in duplicate for their effect on thapsigargin-mediated cell death. Scatterplot between two replicates as percent change of cell viability relative to thapsigargin-treated cells determined by assessing ATP levels. Protective hits were defined as compounds eliciting responses for both replicates individually that were larger than 40% (red dots). The chemical structures of GDC-0879 and forskolin are shown below. Screening of 3115 individual small molecules and identification of several potential complement inhibitors. A, The complement inhibitory activities of 3115 compounds are plotted relative to the negative control. Compound IDs are listed on the X-axis, while complement inhibition (%) is shown along the Y-axis. Compound names are listed for the small molecules with the strongest inhibitory activities. B–G, representative digital phase-contrast images of control wells (B–C) and wells containing treated red blood cells (D–G). NHS, normal human serum. Screening results of the acquired library revealed potential SMIR-10b candidates. A total of 21 compounds from the top 5 percent with >2.5-fold luciferase expression were determined to be positive hits, and selected for further confirmatory assays. (B) Schematic representation describing workflow for synthetic lethality screening with an epigenetics compound library in wtPTEN/mtPTEN cell pairs. (C) IC50 plot of the screening results is shown. Drugs that were selective for wtPTEN were identified, including KW2449 and ENMD-2076. Color codes represent the class of drugs. There were no drugs found selective for mtPTEN cells. The impact of 80 anti-cancer FDA-approved drugs on both ERαlevels and DNA content in 4OH-tamoxifen resistant MCF-7cells as detected by in-cell Western Blotting and in-cell PI staining. (a) Schematic of the experimental settings forin-cellWestern Blotting andin-CellPI staining. All drugs and controls were administered in quadruplicate. For details, please see the text. (a') List of the mathematicaloperation used to analyze the results obtained by all the performed experiments and the statistical parameters used to select potentialpositive hits. (b) Venn diagram for the expected lists of the positive hits extracted from the results, with validation workflow. Robust Z scores(Z*) graphs for drug-treated samples both for ERαlevels (c) and DNA content (d) in 4OH-tamoxifen resistant (Tam-Res) MCF-7 cells; grayarrows indicate the Z* for drugs considered as positive hits, per a threshold set as Z* > 1 (Gray lines). (e) Venn diagram depicting the identifieddrugs that contemporarily reduce ERαlevels (c) and DNA content (d) in Tam-Res MCF-7 cells. (A) Pie diagrams depicting the pharmaceutical categories in the library. (B) Synthetic protocol used for drug administration to MCF-7 cells. (C) Assay data depicting the quantitation of ERa levels in each one of the 162 performedWestern blots. Z0 is the Z factor for negative (DMSO) and positive (E2) controls in each Western blot analysis. Robust Z scores (Z*) graphs for drug-treated samples alone (D), in combination with E2 (E) or for the effect of E2 within each drug-treated sample (i.e., E2þdrug/drug alone) (F); red arrows indicate the Z* for drugs considered as positive hits. Red lines indicate the threshold used for analysis. Scatter plot of average peak amplitude of NAADP-evoked Ca2+ release in the presence of drug (25μM) from LOPAC®1280 (left, numbered 1-1280) or Selleck (GPCR) compound library (right, numbered 1281-1534). B, Top-ranked compounds suppressing ovarian cancer cell growth and their corresponding targets were presented in an inhibitory activity heatmap format. (A, B) PANC1 cells were treated with a kinase inhibitor (10 μM) for 24 hours and then cell viability was assayed. Ranking of the anticancer activity of 273 kinase inhibitors is shown by the heat map; one block represents a kinase inhibitor (A). The top five anti-cancer kinase inhibitors are shown in panel B (n=3, *p < 0.05 versus untreated group). 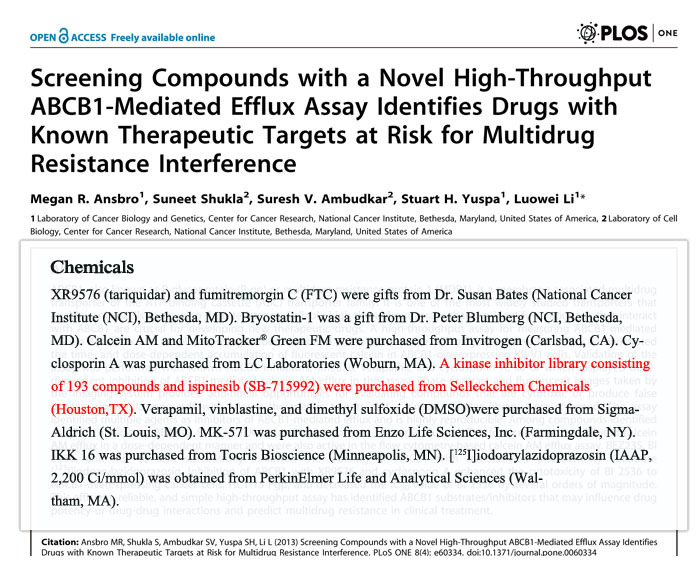 Selleckchem Anti-cancer compound library (414 compounds, #L3000) and Epigenetic library (151 modulators, #L1900) were used for highthroughput chemical screening and cell viability were assayed using Celltiter-Glo luminescent. Vero cells in triplicate wells were pretreated with 10 μM of selected compounds for 1 h, infected with TC83-luc (MOI 0.1) for an hour, then compound-containing media added back to cells. After 16 hpi, luminescence was measured using Promega's BrightGlo and normalized to DMSO-treated infected controls. Data represents a selection of compounds that reduced luminescence by a statistically significant amount without reducing cell viability below 80% compared to DMSO treated controls. *p < 0.05, **p < 0.01, ***p < 0.001. Screening results displaying relative GFP intensity of individual compounds. Representative compounds that led to increased GFP intensity were highlighted in Red, and that led to decreased GFP intensity were highlighted in Blue. (n = 3 for each treatment). Drug repurposing screen in ovarian cancer MCTS identifies unappreciated drug candidates. A, Analysis of RNA-seq data identified genes expressed 1.5-fold or greater in 3D cultures (blue) versus 2D and genes 1.5-fold or greater in 2D cultures (red) versus 3D with a FDR less than 0.05 (dashed line). B, IPA shows the top five regulators inferred from the genes identified to be overexpressed in 3D cultures. C, Representative time-line for drug screening in 2D and 3D cultures. D, Relative viability compared with vehicle (DMSO) compared in both 2D and 3D cultures following 72-hour treatment using 10 μmol/L drug. E, Venn diagram representing unique and common drug hits: 2D hits with >75% reduction viability in 2D cultures and <50% reduction in viability in 3D cultures; 2D and 3D hits with >75% reduction in viability for both 2D and 3D cultures; and 3D hits with >75% reduction in viability in 3D cultures and <50% reduction in viability in 2D cultures. Heat map depicting changes in PD-L1 and HLA-I expression from 44 selected compounds out of 484 compounds in the L1100 library and organized by target. PD-L1 and HLA-I levels were assessed by flow cytometry in C8161 cells treated with compounds at the four indicated concentrations and shown as fold change by comparing MFIs of PD-L1 and HLA-I to vehicle-treated cells. Values were excluded and shaded in gray when cell viability was 50% below vehicle-treated controls. Reg and NU are indicated on the left. A) Average Z-score representing effect on cell viability of individual inhibitors to SINETs (GOT1/P-STS) and PanNETs (BON-1/QGP-1), plotted against each other. Groups of inhibitors that are significantly more potent against SINETs or PanNETs are marked by colour. HTS results. The dotted line indicates the cutoff for hit definition. Tm = 58.4 ˚C was the cut-off of hit identification. Some points were as high as 90 ˚C and are not visible due to scaling. High-throughput screening of 273 kinase inhibitors identifies 12 compounds that enhance adeno-associated viral (AAV) transduction. (A and B) Enhanced green fluorescent protein (eGFP)-positive cells/total cells: results from the analysis were organized and plotted in ascending value both in the chart (A) and in the table (B). The dashed line indicates the value obtained with the PI as positive control. (C and D) Mean fluorescence intensity in eGFP-positive cells normalized to the mean eGFP fluorescence intensity measured in the positive control (PI 7.5 μM): results from the analysis were organized and plotted in ascending value both in the chart (C) and in the table (D). PI, proteasome inhibitor (Calpain inhibitor 1); ID, identification number (according to the coordinates on the 384-well plate). Values are presented as the mean of three independent experiments. The Assay. Cells: 3T3-L1 fibroblasts stably expressing HA-Glut4/GFP are differentiated into adipocytes in 96 well plates. The cells develop a 3-dimensional co-culture of adipocytes imbedded in a collagen matrix, with a monolayer of fibroblasts on the plastic. Screening: The cultures are incubated in serum free media for 2 h (basal) at 37°C. Insulin is added, and cells incubated for 45 min. Compound is added, and cells incubated for 1 h. Cells are placed on ice, and surface Glut4 labeled with AF647- conjugated anti-HA antibody. Cells are detached from the plate with collagenase, and analyzed by flow cytometry. A) Insulin dose response. B) Time course. C) Pilot screen. D) Identification of “Hits”. Activators (green)- relative geometric mean fluorescence (rGMF) ≥ 1.5, inhibitors (red) rGMF ≤ 0.62. 64 activators and 65 inhibitors were verified by rescreening, representative compounds were confirmed with pure compound and validated by concentration response, SAR, and time course. A unique collection of 2533 FDA approved drugs for high throughput screening (HTS) and high content screening (HCS). A unique collection of 2570 preclinical and clinical compounds for high throughput screening (HTS) and high content screening (HCS). A unique collection of 5027 bioactive chemical compounds for high throughput screening (HTS) and high content screening (HCS). A unique collection of 7000 bioactive chemical compounds for high throughput screening (HTS) and high content screening (HCS). A unique collection of 4208 chemical compounds featured different core structures and structural diversities respectively for high throughput screening (HTS) and high content screening (HCS). A unique collection of 1869 natural products for high throughput screening (HTS) and high content screening (HCS). 279 small collections of human endogenous metabolites, involving multiple metabolic pathways, which can be used for high-throughput screening, opening up new ways for humans to treat various diseases such as tumors. A unique collection of 111 small molecules used for angiogenesis research targeting Bcr-Abl,BTK,HIF,VEGFR,FGFR,FAK,etc.Abnormal angiogenesis can lead to a variety of diseases,such as tumors, diabetes,immune diseases and so on.Therefore,angiogenesis has become a drug target for the treatment of these diseases. A unique collection of 1919 anti-cancer small molecules for 12 types of cancers: Breast Cancer, Leukemia, Lung Cancer, Lymphoma, etc. A unique collection of 155 small molecules affecting the development of diabetes. A unique collection of 921 anti-infective small molecules with biological activity of antibiotics,antifungal drugs,anti-HIV,etc. A unique collection of 691 small molecules used for apoptosis research targeting Bcl-2,Caspase,p53,TNF-alpha,Mdm2,survivin, etc. A unique collection of 641 small molecules with autophagy-inducing or autophagy-inhibiting activity. A unique collection of 247 anti-cancer compounds for high throughput screening (HTS) and high content screening (HCS). A unique collection of 2719 drugs that are marketed around the world or that have passed phase 1 clinical trials for high throughput screening (HTS) and high content screening (HCS). Selleck Epigenetic inhibitor Library contains various small molecule modulators (inhibitors and activators) with biological activity used for epigenetic research and associated assays. A unique collection of 1015 Fragment compounds for Fragment-Based Drug Discovery (FBDD). Selleck GPCR Small Molecule Compound Library contains various small molecules targeting G protein coupled receptors with biological activity. A unique collection of 112 small molecule compounds with biological activity used for epigenetic research and associated assays. A unique collection of 110000 innovative compounds features numerous structurally diverse compounds and several alternate compositions. A unique collection of 1080 small molecules modulators (inhibitors and activators) with biological activity used for Immunology/Inflammation research and associated assays. A unique collection of 2705 inhibitors for high throughput screening (HTS) and high content screening (HCS). A unique collection of 230 small molecule modulators used for Ion channel research. A unique collection of 94 small molecule inhibitors used for MAPK signaling research. A unique collection of 903 small molecules with biological activity in numerous metabolic pathway: glycometabolism, lipid metabolism, proteolysis, etc. A unique collection of 174 small molecule inhibitors used for PI3K/Akt/mTOR pathway research. A unique collection of 228 small molecule inhibitors used for chemical genomics, high-throughput screening (HTS), and high content screening (HCS). Selleck Stem Cell Small Molecule Compound Library contains various small molecule inhibitors with biological activity used for stem cell regulatory and signaling pathway research. A unique collection of 317 validated bioactive compounds covering over 123 targets. Tyrosine Kinase Inhibitor library is ideal database for high-throughput screening (HTS) and cell based high-content screening (HCS).